Today’s consumer is more demanding about the product we are providing them and we cannot take their expectations for granted. They want to know more about how we feed and care for our animals. They want a safe and wholesome product and they expect us to produce it in a sustainable fashion that protects the environment. One very visible change that the beef industry has made in recent years is the fact that we are providing more branded products than ever that suit the specific needs of the consumer. The meat case at your local grocer may offer choices such as all-natural, hormone-free, grass-fed, and other brands to meet a wide variety of tastes. Today’s consumer appears to be more willing than ever to pay for quality. In 2017, a greater percentage of cattle were harvested for higher quality grades (mid-Choice and higher) than were for the Select grade of beef. This increase in the production of higher quality beef has allowed brands such as Certified Angus Beef to achieve record sales. Global customers for U.S. beef have shown a strong preference for our product. U.S. beef exports for the first half of 2018 were up 15 percent in volume and up 20 percent in value compared to the same period a year earlier. The top export markets for U.S. beef thus far in 2018 (in order) are Japan, South Korea, Mexico, Hong Kong, Canada, and Taiwan. 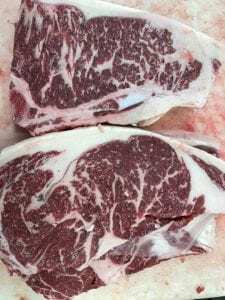 The potential for growth in China and other countries is significant but the U.S. beef industry will have to adjust to their traceability requirements and restrictions on hormones and beta agonists to fully capitalize on these markets. Beef marketers are using innovative ideas to put beef on consumers’ plates. With online purchases, consumers are quickly changing how they are going to obtain food for their families. Meal kits deliver food ingredients directly to consumers in individually packaged proportions. These kits come with step-by-step recipes and allow the consumer to efficiently cook meals at home. While meal kits may be more expensive for consumers, they may eliminate the need for some to go grocery shopping. Beef is a popular component in the meal kit segment. Retail grocers are looking at using technology to attract customers. Increasing numbers of consumers are purchasing groceries online across the country. Groceries can then be picked up curbside at the store or in some locations actually delivered directly to the consumer’s home. Beef sales should benefit from increased convenience for the consumer. While this concept is relatively new, it would be premature to dismiss the long-term potential of this use of technology by the consumer. A growing middle class around the world is increasing the global demand for protein. There is also an increasing consumer desire for foods that have been produced in a sustainable manner. For beef, that means a supply chain that is socially responsible, environmentally sound and economically viable. Today’s cattlemen must be responsive to the public’s demand for more transparency about how we produce beef. If we ignore our customer’s requests for more sustainable production of beef, we will lose their trust and ultimately hurt demand for our product. I am sure most of you are familiar with the phrase “The customer is always right.” This phrase may be more meaningful than ever for the beef industry. Posted by Smith at 5:15am November 14, 2018 Posted in Economics, Quality Assurance. Bookmark the permalink.